An anemometer is an instrument used to measure the speed or velocity of gases either in a contained flow, such as airflow in a duct, or in unconfined flows, such as atmospheric wind. To determine the velocity of the wind, an anemometer detects change in some physical property of the fluid or the effect of the fluid on a mechanical device inserted into the flow. What does the word anemometer mean? The cup anemometer (used in weather stations) measures the air velocity in a plane perpendicular to the axis of its rotation cups. If the cup anemometer is mounted with the shaft perpendicular to the horizontal, it will measure only the component of the wind that is parallel to the ground. Other wind speed meter, such as vane anemometers, are used with the tip aligned with the total velocity vector. Before using an anemometer, it is important to determine how it should be positioned and what component of the total velocity its measurement represents. How does an air velocity probe work? Air velocity probes are used to measure air flows and are insensitive to the presence of moderate amounts of dust. They maintain a temperature differential between two RTDs mounted on the sensor tube. The upper sensor measures the ambient temperature of the gas and continuously maintains the second RTD (near the tip of the probe) at 60°F above ambient. The higher the gas velocity, the more current is required to maintain the temperature differential. Another version of the velocity probe is the venturi-type thermal mass flowmeter, which places a heated mass flow sensor at the minimum diameter of a venturi flow element and a temperature compensation probe downstream. An inlet screen mixes the flow to make the temperature uniform. This design is used for both gas and liquid measurement (including slurries), with flow range a function of the size of the venturi. Pressure drop is relatively low and precision is dependent upon finding the proper probe insertion depth. A flow switch version is also available that contains two temperature sensors in the tip. One of the sensors is heated and the temperature difference is a measure of velocity. The switch can be used to detect high or low flow within 5%. What are Hot Wire Anemometers? The term anemometer was derived from the Greek words anemos, "wind," and metron, "measure." Mechanical anemometers were first developed back in the 15th century to measure wind speed. 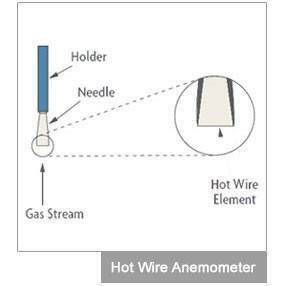 A hot-wire anemometer consists of an electrically heated, fine-wire element (0.00016 inch in diameter and 0.05 inch long) supported by needles at its ends (Figure 5-11). Tungsten is used as the wire material because of its strength and high temperature coefficient of resistance. When placed in a moving stream of gas, the wire cools; the rate of cooling corresponds to the mass flowrate. The circuitry of the heated sensing element is controlled by one of two types of solid-state electronic circuits: constant-temperature or constant-power. The constant-temperature sensor maintains a constant temperature differential between a heated sensor and a reference sensor; the amount of power required to maintain the differential is measured as an indication of the mass flow rate. 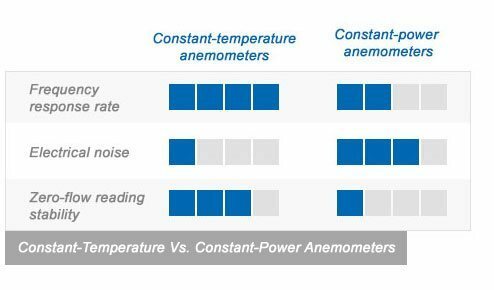 Constant-temperature anemometers are popular because of their high-frequency response, low electronic noise level, immunity from sensor burnout when airflow suddenly drops, compatibility with hot-film sensors, and their applicability to liquid or gas flows.